Make yourself ready! Saturday evening is going to be colourful! Tirana Ekspres invites for “Music meets Arts in May” on Saturday 30th of May 2015 at 19.00. 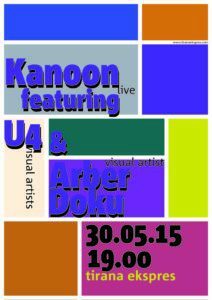 The program holds “Kanoon” as live act for our sense of hearing, since they just stimulate one of our senses, “U4” and “Arber Doku” going to do something for the eyes! Paintings, drawings, installation and video-art, will enrich our evening. The young, but very talented painter and drawer “Arber Doku” presents his works, collected of a long time, called “Kalate e Shqiperise ne punim rabiti”. Mainly shown parts of the Albanian history, old cities, but also colourful paintings of the world that surrounds the artist. Enjoy this colourful and diverse evening together with us! Take care and see you at Tirana Ekspres!